How To tell Google to Remove your Content or Site from Google Services? Google, as you might well know has a wide, vertical range of products and services served along the main course that is Google Search. Such services include Google Shopping, Flights, Hotels, Google Advisor, Google Plus Local Search, and so on. Sometimes, some of the content on your site also gets included in these services if relevant. But in some cases, you might not want your content to appear on such products and services. Now you can ask Google not to include your content in search results through your Robots file, but that doesn't really solve the problem does it? It'll take your content off Google entirely. So how to exclude your content from the extra Google services only? Well, Google has now given you a solution in the form of an Opt-out Tool, where you can choose your content to be not included in such products and services. Before we talk about the background behind this initiative, let me first tell you how you (publishers) can opt out of these five select Google services, namely Google Shopping, Google Flights, Google Hotels, Google Advisor, and Google Plus Local `Search. This tool can be found within Google Webmaster Tools. 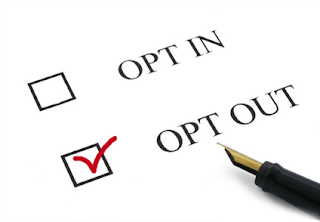 Follow this link to the Opt-Out Tool, and choose a website you want to use this tool for. You must be logged into Google Webmaster Tools to access this tool. Remember! This tool is only available for domain level sites. Sub-domain websites (such as example.blogspot.com) won't get this option. You will need your own domain (example.com) to access this option. After selecting a site, and clicking on the Opt Out button will result in the removal of your site's contents from the aforementioned Google Services. However, this won't result in the immediate deletion of the records Google has of your site. That won't happen until another thirty days, giving you ample time to re-think your decision, and roll back the changes if necessary. Notice that as yet, you can only opt out of all of the five services, or no services at all. An all-or-nothing approach, if you will. You can selectively choose a single service. Why would you want to get your contents excluded? Interestingly, not all of these listed services are free. Some require you to pay in order to get your content listed in them. So what exactly is the use of this tool, and why would people want to use it? From some sites, Google picks up more than just their raw content. It also gathers things like review data from the web, and associates it with product or place listings. Not all publishers would want Google to collect such data, and deliver it in its own way, such as summarizing it, and so on. Previously, if such publishers wanted Google to not collect such data, then the only option they had was to opt-out of Google altogether, and that includes Google Search as well. And as you might know, Google enjoys more than 66% of the search engine market share. So opting out completely would mean that publishers would lose more than two-thirds of their organic search traffic. So clearly, such an option is out of the question for most publishers. Google took this initiative in response to its agreement with the US Federal Trade Commission (FTC) over anti-trust charges. Publishers were worried about Google's policies, since they didn't want to get de-indexed from search. Yet at the same time, their appearance in other products wasn't acceptable either. So the FTC won this battle for such publishers. Google will give websites the ability to “opt out” of display on Google vertical properties. Under the same commitment, Google also has promised to provide all websites the option to keep their content out of Google’s vertical search offerings, while still having them appear in Google’s general, or “organic,” web search results. So as it appears, by applying its all-or-nothing policy with its services, Google is trying to merely satisfy the FTC, without actually considering the Publishers' concerns. But at least it's a start. Further enhancements might be on their way.